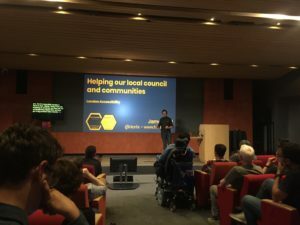 Carrying on the ‘HeX World Tour’, our Creative Director, James, went down to the London Accessibility Meetup on 23 August to talk about how the community can help local authorities when it comes to accessibility. The London Accessibility Meetup takes place monthly and was attended by more than 120 people who come from different walks of life, but who share a passion for web accessibility. During his presentation, James talked about the newest report from SOCITM (Society for IT practitioners in the public sector) which has revealed that 40% of local authority websites are not accessible for those with a disability. He spoke about how budgets for councils nationwide are being slashed, and how it’s important for us all to offer a helping hand and find out how we can assist our local councils. James also shared his experience in working for local authorities, both as an employee and from an agency perspective. In summary, the talk outlined how, as a digital community, we can support our local authorities. London Accessibility Meetup is the fourth stop on HeX’s ‘tour’ across the world, spreading the benefits of accessibility to businesses and individuals. So far, James has spoken at events in Belfast, Boston (USA) and Brighton, with dates booked for Freiburg, New York and Amsterdam later this year. To keep up to date with our own accessibility journey and the events we attend, follow us on Twitter or keep a lookout for more blogs in the future. You can also come along to our very own accessibility event, Nottingham Accessibility, on the 8th October. You can register to attend via the Evenbrite page.